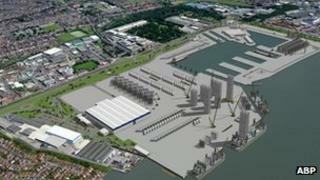 Plans to build a £210m wind turbine factory on Hull's Alexandra Dock have been approved by councillors. Green Port Hull is a collaboration between German engineering giant Siemens and the dock's owners, Associated British Ports (ABP). Siemens said the factory would employ 700 people making blades and turbine units for offshore wind farms. Hull City Council said the project was a "key milestone" for the region to be a hub for the UK's renewable sector. Councillor Steven Bayes said: "There is still lots to do with elements of the plans being prepared to be passed to the secretary of state, ahead of a final investment decision by Siemens being made later in the year. "In the meantime, the council and its partners will continue working towards making sure Hull and the surrounding region achieves its aims of becoming the UK renewables hub." Siemens will spend £80m on the factory, with ABP investing a reported £130m on the dock's infrastructure. The factory is expected to open in 2014. Secretary of State for Energy and Climate Change Ed Davey said the development would "give confidence to our domestic manufacturing supply chain". "Today's announcement is fantastic news," he said. "The Humber can make a serious contribution to the UK's renewable energy future. Its location and sheer proximity to some of the potential new wind projects in the North Sea puts the region in pole position to benefit from investment in renewables. "The enthusiasm of the local community has been key to the success of this project so far and it is great to see further progress being made." Hull fought off bids from other European cities to land the proposed new factory. Local business leaders have claimed the development of the renewable energy sector could lead to thousands of new jobs across the Humber region. 'Green Port' approval: A wind of change for the Humber?